If you've glanced at the title and thought 'no, doesn't apply to me because I've only just started my business' - think again. So important are business exit strategies that many professional advisers believe they should be incorporated into a business plan: in other words, that even before an entrepreneur starts a business, they needs to know when, and how, to get out of it. And no, spending time thinking about leaving your company does not indicate an abysmal lack of confidence in your creation! An exit strategy is the ultimate goal towards which you are working. However, it is much more than your plan to get out: it's also thinking about maximising the value of your business for the particular time you intend to go. The only rules are that the strategy must be right for you, and it must be flexible to accommodate your personal growth, and the evolution of your goals and your business. 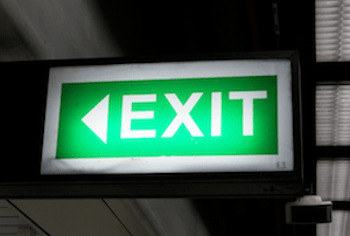 There are several ways you can exit your company: you can sell it; it may be acquired by, or merged with, another enterprise; you can go public with an IPO; you may pass the reins to another family member; you can arrange an employee buy-out; or you can simply close the doors and cease trading, which is without question the simplest option, but also the one with least financial reward. Sadly, the latter often turns out to be the default strategy of business owners whose official business exit strategy is to manage their business until they no longer have the energy to continue - the worst business exit strategy of all, but also the most common. An owner continues to run the business until they wake up one morning knowing they just can't do it any more. They starts desperately seeking an exit, taking whatever they can get, which in most instances is significantly less than if they had planned their business exit strategy when the fire for the business still burned strong. Putting an exit strategy in place sooner rather than later boils down to simple common sense. Leaving it until you are desperate to get out, then attempting to sell your business at short notice, rarely works. The reason? You are not in control of the sale. And failing to find a buyer willing to pay a fair price can be a devastating experience for someone who has put everything - financially, physically and emotionally - into their business, with the long-term intention that it will generate a retirement fund. To run a business successfully, it's crucial to know what your exit strategy is at any given moment, because it impacts everything you do. As an example: if your vision is to sell to a strategic partner or competitor who already has in place similar facilities and its own distribution network, you may decide to focus on product development or aggressive marketing to expand your customer base. Give some thought to the type of business buyer you'll target, for different buyers have different motivations. A strategic buyer looks for synergies, whereas a financial buyer seeks profitability and may not be concerned about creating a dynamic marriage. Try to get inside the heads of these potential owners to determine what may turn them off the deal. Look at factors such as problem equipment and problem employees. Look at your supply chain, and your inventory, distribution and logistics systems. Be prepared to modernise systems and processes, for the investment may result in a sale premium. As part of a thorough due diligence process, prospective buyers typically review in detail every aspect of a business. In preparing the answers to potential buyers' questions, the owner must dig deeply: frequently, it's the first time since starting the business such an intense review has been performed. After going through this process, owners often say that they have never understood their businesses so well; many even declare that had they known all the things they discovered, they could have been much more successful. This is something to take on board: make it your objective to run your business so that if you received an irresistible offer today, you would be confident that the buyer's due diligence would unearth nothing that would cause them to withdraw it. Once or twice a year, look at your business as though you were interested in purchasing it. Overall appearance and tidiness of premises inside and outside. 'Street appeal' is as important to commercial property as it is to residential property. Condition of plant, fittings and office machinery. Is equipment being maintained properly? Is computer hardware and software current? Do you have in place a schedule for systematic replacement of ageing equipment? Customer files. Are detailed customer records maintained either on computer or on a hand-written card-file system? Is the information up to date? Is it accessible by all who need it - or does one person, or one department guard it jealously? Worse, is it recorded only in someone's head? Documenting customer information is critical: consider installing CRM or contact management software, and ensure that everyone is trained to use the system. Accounting systems. Is your debtors' ledger clean and current? Are invoices raised and send promptly? Do you make it easy for customers to remit promptly? Are effective collection procedures in place to reduce overdues? Policies and procedures. Are they all documented? Is that documentation current? Are written procedures updated as processes alter? Is there consistency in the way staff perform tasks? Complaint handling. Are documented procedures in place for effective complaint handling? Are they being followed? Financial accounts. Clean financial records are fundamental for valuing a business. Even the smallest business should have accounting software and systems that ensure everything is processed on a day-to-day basis so that at any given time, you know exactly how your business is travelling. Large businesses should produce financial accounts on a monthly basis. Taxation returns. All taxation matters should be up-to-date. Hollow logs should be cleaned out and any other 'dodgy' practices addressed, with proper procedures followed in future. Litigation. What, if any, litigation is pending? Are there any sexual harassment claims that haven't been properly dealt with? Are procedures properly in place for handling this very sensitive area? Are all staff members properly trained in harassment issues? What about workers' compensation claims? Are all staff members trained in occupational health and safety issues? Staffing. Ensure people have the equipment and skills they need to do their jobs. Perform a training needs analysis to determine where shortfalls may exist in people's ability to do their jobs. Annual performance reviews are also important, even in the smallest business. Check that employee records are current, with accurate records of entitlements, as well as notes about cautions, warnings, and counselling. Inventory. Get rid of any unsaleable stock. Ensure that the warehouse layout meets current requirements, that everything is neat and orderly. Audit physical inventory count against computer records to gauge accuracy of systems and staff. Address problems. Profit from this frank analysis by making improvements so that each year, your business gains in value in everyone's eyes. Be "Business sale ready" by having a business exit strategy.